Averil Power got the nod, but Gerard Craughwell did not. 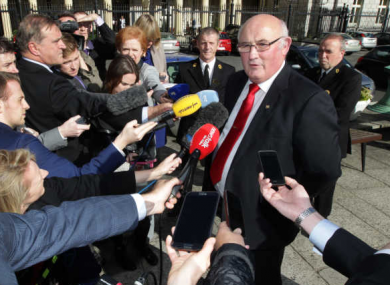 SENATOR GERARD CRAUGHWELL has said he is “dismayed” at being blocked from joining the Seanad independent nominees group. Craughwell said he has attempted to join the group twice but been denied on both occasions. He claims he was told the group does not wish to accept any new members. Craughwell said he tried for a second time after witnessing the group welcome former Fianna Fáil Senator with “open arms”. “This is a very disappointing situation and no explanation has been given to me apart from the fact that there was not unanimous acceptance of my application. I don’t understand why this is or why I am seen as somehow incompatible with the group. In almost every debate where members of the independent group have participated I have almost always been ad idem with the grouping. When Senator Power joined the grouping with such ease I was encouraged that I too might reapply and be granted the same opportunity. However, it would appear that not all senators are equal. Craughwell said the technical group in the Dáil is a good example of people from various backgrounds working well together. He added that it is unfair his speaking speaking time is restricted as a result of him not being in the group. TheJournal.ie contacted the leader of the independent group of senators, Jillian van Turnhout, but she said she was “not available to comment” as she’s discussing child protection issues at an EU meeting in Brussels. Other members of the group include Fiach Mac Conghail, Mary Ann O’Brien, Marie-Louise O’Donnell and Katherine Zappone. After Averil’s shock departure, how do other parties shape up in terms of women? Email “Our newest Senator is 'dismayed' at being denied entry to independent group ”. Feedback on “Our newest Senator is 'dismayed' at being denied entry to independent group ”.